One of the most important parts of a process is the executing program code. This code is read in from an executable file and executed within the program's address space. Normal program execution occurs in user-space. When a program executes a system call or triggers an exception, it enters kernel-space. At this point, the kernel is said to be "executing on behalf of the process" and is in process context. When in process context, the current macro is valid. Upon exiting the kernel, the process resumes execution in user-space, unless a higher-priority process has become runnable in the interim(过渡期), in which case the scheduler is invoked to select the higher priority process. Other than process context there is interrupt context, In interrupt context, the system is not running on behalf of a process, but is executing an interrupt handler. There is no process tied to interrupt handlers and consequently no process context. System calls and exception handlers are well-defined interfaces into the kernel. A process can begin executing in kernel-space only through one of these interfaces -- all access to the kernel is through these interfaces. When executing an interrupt handler or bottom half, the kernel is in interrupt context. Recall that process context is the mode of operation the kernel is in while it is executing on behalf of a process -- for example, executing a system call or running a kernel thread. In process context, the current macro points to the associated task. Furthermore, because a process is coupled to the kernel in process context(因为进程是以进程上文的形式连接到内核中的), process context can sleep or otherwise invoke the scheduler. Interrupt context is time critical because the interrupt handler interrupts other code. Code should be quick and simple. Busy looping is discouraged. This is a very important point; always keep in mind that your interrupt handler has interrupted other code (possibly even another interrupt handler on a different line!). Because of this asynchronous nature, it is imperative(必须) that all interrupt handlers be as quick and as simple as possible. As much as possible, work should be pushed out from the interrupt handler and performed in a bottom half, which runs at a more convenient time. The setup of an interrupt handler's stacks is a configuration option. Historically, interrupt handlers did not receive(拥有) their own stacks. Instead, they would share the stack of the process that they interrupted. 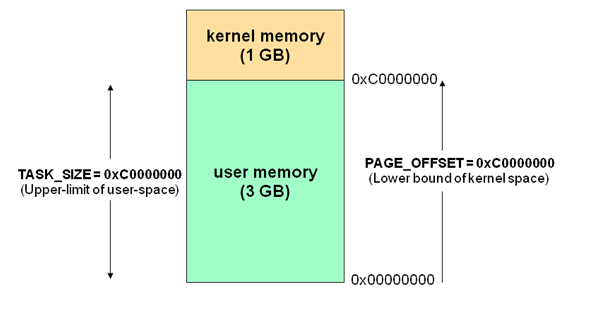 The kernel stack is two pages in size; typically, that is 8KB on 32-bit architectures and 16KB on 64-bit architectures. Because in this setup interrupt handlers share the stack, they must be exceptionally frugal(必须非常节省) with what data they allocate there. Of course, the kernel stack is limited to begin with, so all kernel code should be cautious. A process is always running. When nothing else is schedulable, the idle task runs.